32983 12th Battalion Suffolk Regiment. William enlisted in Sudbury and served with the Suffolk Regiment. The 12th Battalion was formed at Bury St. Edmunds in July 1915 as a ‘bantam battalion’. Bantam battalions were made up of men who had originally been rejected as being under height but were otherwise fit for service. The 12th Battalion was attached to 121st Brigade and formed part of 40th Division. This division was made up of a mixture of regular and bantam battalions. The battalion was the last of the Suffolk battalions to arrive in France in early June 1916. Between June and late October 1916 the 40th Division served on the front near Loos before taking part in the final phase of the First Battle of the Somme at the Battle of Ancre (13th-18th November). In the spring of 1917 it was involved in the German retreat to the Hindenburg Line. William was killed in action 25th September 1917. There is no known grave and he is remembered on the Thiepval Memorial, Somme, France. The Thiepval Memorial bears the names of 72,089 casualties who lost their lives in the Somme sector and who have no known grave. William was awarded the British War Medal and Victory Medal. He is recorded as H W Partridge on the War Memorial. 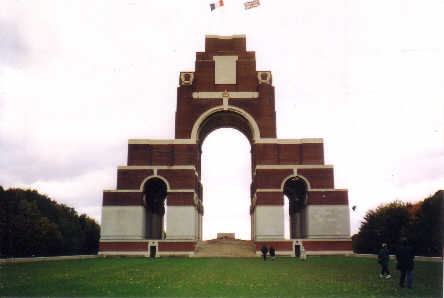 A Cross of Remembrance was laid at the Thiepval Memorial on 16th April 2006.